Foolamancy is a form of magic that revolves around mental illusions and what units perceive. 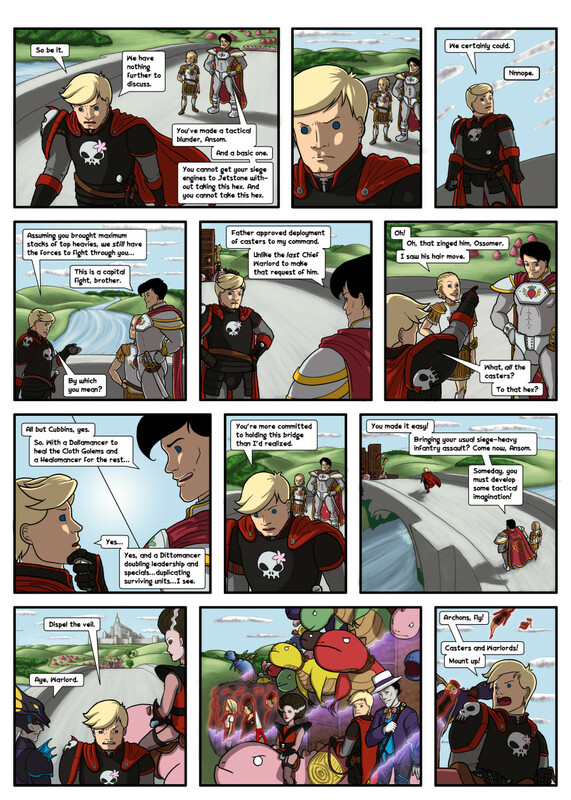 It essentially feeds other units stories of what the Foolamancer wants them to see, and their own minds fill in the rest. Veiling Units or even Cities, disguising things as something else. Can manipulate the senses to create large scale illusions and sounds at high volume levels, as when Jack Snipe creates a gigantic projection of Stanley and "plays" martial music during the celebration of Stanley's return to Gobwin Knob. Along the same lines, it can also simulate taste and touch. It can even be used to fool ruler sense. Foolamancers can selectively project illusions that can be perceived by only a single unit. Transfer a mental image of the Foolamancer's own sight to another unit, which can be very useful if said unit has been blinded. They can also see what another unit sees, including hallucinations. Jack Snipe: in service to Gobwin Knob and previously Faq. Some Archons, like Bonnie, have the foolamancy special and can therefore cast some foolamancy spells, even though they are not full Foolamancers. It is suggested that chances to see through a veil are determined by the number of units veiled multiplied by the number of warlords looking. In Page 107Erf-b1-p107 there are 11 warlords looking for "30 or so" units giving around 300 chances. A direct multiplication would give 330 chances for that particular stack to find 30 veiled units. Another explanation for "330 chances" is that each warlord rolls once against each veiled unit that it might see. If the roll is a success, that warlord sees that unit. The chances of winning that roll would therefore still be unknown. Jack's statement that all Eyemancers must, by necessity, look means that a Foolamancer must know what is there in order to effectively create an illusion of what is not there. This page was last edited on 10 January 2018, at 01:23.